Prince Harry and Meghan Markle in St George's Chapel at Windsor Castle during their wedding service. We've finally seen Meghan Markle's wedding dress! Kensington Palace confirmed this morning that British designer Clare Waight Keller is behind Markle's stunning gown. The palace noted that Waight Keller became the first female Artistic Director of the fashion house Givenchy last year. We first got a glimpse of Markle in her wedding dress as she departed Cliveden House in a car with her mother, Doria Ragland, on their way to St. George's Chapel in Windsor Castle. Meghan Markle with her mother Doria Ragland departs for her wedding to Britain's Prince Harry, in Taplow, Britain, May 19, 2018. According to the palace, the Queen lent Markle the Queen Mary's diamond bandeau tiara. The tiara was made in 1932, and the brooch in the middle dates to 1893. "After meeting Ms. Waight Keller in early 2018, Ms. Markle chose to work with her for her timeless and elegant aesthetic, impeccable tailoring, and relaxed demeanour," the palace said in a statement. "Ms. Markle also wanted to highlight the success of a leading British talent who has now served as the creative head of three globally influential fashion houses — Pringle of Scotland, Chloé, and now Givenchy." "Ms. Markle and Ms. Waight Keller worked closely together on the design. The dress epitomises a timeless minimal elegance referencing the codes of the iconic House of Givenchy and showcasing the expert craftsmanship of its world-renowned Parisian couture atelier founded in 1952." The pure white gown is made of bonded silk cady and features an open bateau neckline, three-quarter sleeves, and an underskirt in triple silk organza. 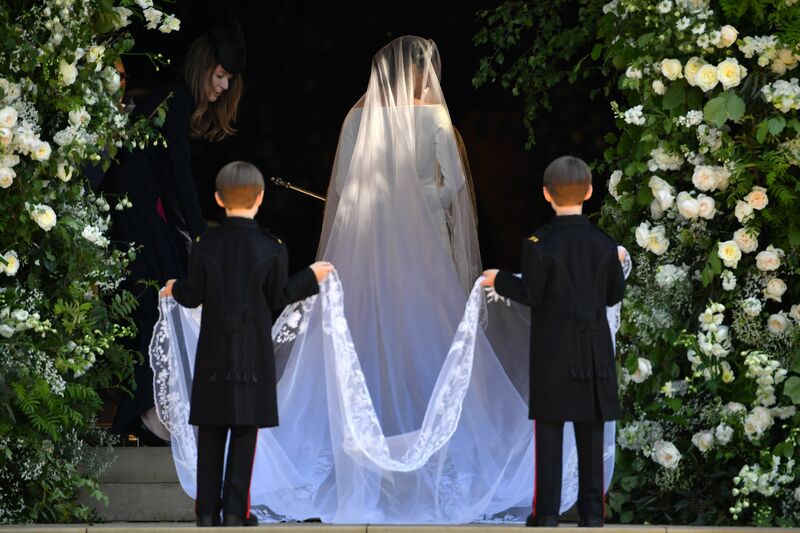 The five-metre long veil is made from silk tulle, with hand-embroidered flowers along the trim. Each flora represents a Commonwealth country — 53 in total. Canada is represented by the bunchberry. "Each flower was worked flat, in three dimensions to create a unique and delicate design," the palace noted. "The workers spent hundreds of hours meticulously sewing and washing their hands every thirty minutes to keep the tulle and threads pristine." Meghan Markle arrives at St George's Chapel at Windsor Castle for her wedding to Prince Harry. 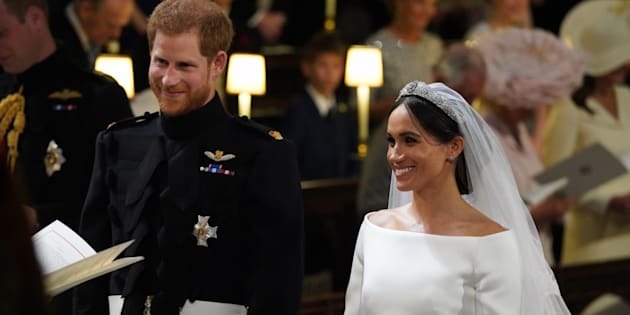 "Ms. Markle wanted to express her gratitude for the opportunity to support the work of the Commonwealth by incorporating references to its members into the design of her wedding dress," the palace said. In the months leading up to the royal wedding, media outlets predicted a variety of potential designers who could take on the monumental task. Names thrown about included Ralph & Russo, who designed Markle's engagement dress, Erdem, Victoria Beckham, Stella McCartney and Alexander McQueen. Meghan Markle in St George's Chapel at Windsor Castle during her wedding to Prince Harry. According to reports, Markle's BFF, Canadian stylist Jessica Mulroney helped her pick out the gown and advised her on other aspects of the wedding, such as the flowers and decorations, according to The Telegraph. It's also expected that Markle will change into a second outfit between the afternoon and evening receptions. Meghan Markle arrives for her wedding ceremony. Earlier this month, Priyanka Chopra, one of Markle's good friends, hinted that Markle got emotional when she chose her wedding dress. When asked by Andy Cohen whether Markle cried when she found her gown, Chopra, who is attending the wedding, smile and buried her face in her hands, prompting Cohen to say, "Yes."